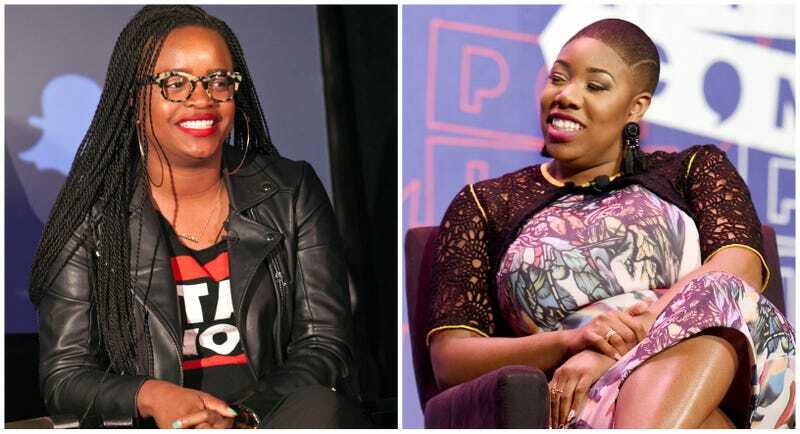 Brittany Packnett, left, participates in a panel at The Harvey B. Gantt Center for African American Arts + Culture on May 11, 2017 in Charlotte, North Carolina; Symone Sanders at the ‘Pod Save America’ panel during Politicon on July 29, 2017 in Pasadena, California. So, as activist-educator Brittany Packnett and political pundit Symone Sanders wrapped up an otherwise blissful trip to Nairobi, Kenya on Thursday evening (where they were guests of the International Fund for Animal Welfare), they were no doubt bracing themselves for a return to the daily grind. What they were not expecting was to become victims of assault before they even boarded the plane. While awaiting their flight home on Kenya Airways (a SkyTeam affiliate), the two friends were attempting to relax in Kenya Airways’ Simba Lounge as a clearly inebriated man nearby disturbed the peace of pretty much everyone within earshot. As both Sanders and Packnett recounted the story, the man was only subdued when other men intervened—a detail that’s telling, as well as the man’s treatment of the lounge attendant, who was the only other black woman mentioned in the incident. But equally alarming to many watching the incident play out on social media: Despite heightened security in airports across the globe for nearly two decades, security was not immediately on the scene to address the issue. In fact, it took nearly 30 minutes for them to arrive. And even as Packnett identified the man who’d assaulted her, police were still not on the scene. Reportedly equally unresponsive were Delta’s staff, both in the lounge and on the phone. As Sanders relayed, it took nearly an hour for police to arrive and arrest the attacker, identified as British citizen Duncan Conrad Hockey. Though Packnett and Sanders were able to depart Nairobi as planned, as of early this morning, neither Delta nor Kenya Airways had followed up or issued any statement on the matter. But as traveling while black and female clearly remains a risky undertaking, so does being believed and perceived as a victim. While response to Packnett’s reporting of the incident received an outpouring of support, her identification of her attacker as a white man was met with an onslaught of criticism and added insult to injury. The Root has reached out to both Delta Airlines and Kenya Airways for comment, and will update this story as needed. “In your story you note Ms. Packnett was in a Delta Club where the incident took place.